Farikal | Lamb and Cabbage Stew is a Norwegian food recipe slowly cooked on the stove. Slice the cabbage into “boats” by radiating slices from the center outward. 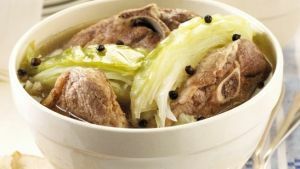 In a wide, heavy pot, layer the meat with the cabbage, sprinkling each layer with salt, flour and peppercorns, ending with a layer of cabbage. Add the water. Bring to a boil and simmer until the meat is tender, about 1½ hours.